In California, we ask water managers to do the near-impossible task of managing rivers for both environmental and economic objectives, which are often at odds. Where we have repeatedly failed to stem or reverse environmental problems, environmental regulation can drive water management. California’s Bay Delta – a water source for 25 million people and about 3 million acres of farmland – is a prime example. No sooner did Gov. Jerry Brown declare a statewide drought emergency in January than enforcers of the Endangered Species Act ordered big cuts in Delta water exports to protect the delta smelt, a native species on the brink of extinction. Addressing environmental problems directly would allow water supply, hydropower, flood control and other economic objectives to play a larger role in decision-making. One way to fix environmental problems is by removing some dams, using a systems analysis to evaluate costs and benefits and prioritize for removal. Typically, these studies are done site-by-site. They do not look at how the remaining system of dams could be re-operated to minimize water scarcity, maintain hydropower generation, maintain flood protection and improve environmental performance. Also, most dam removal studies overestimate water supply benefit because they use reservoir storage capacity as the economic metric. Storage in watersheds has decreasing marginal economic benefit – the millionth acre-foot of storage is less valuable than the first acre-foot. Reservoir space to store water and water to fill that space are not the same. These oversights potentially limit the pool of candidates for removal. Better methods are needed to prioritize dams that could be removed within larger water systems. 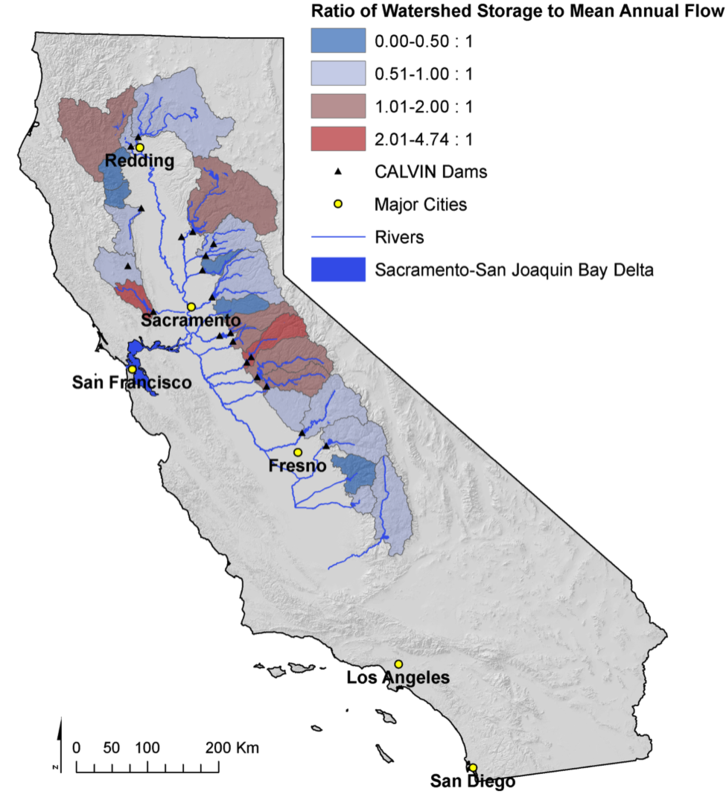 For regions like California with extensive interconnected water systems, we may be able to remove some dams without reducing overall economic benefits. The state certainly has no shortage of potential candidates for removal. Some dams would not be built today because their environmental or socio-economic costs exceed benefits. Other large dams were built subsequently to smaller dams, creating redundancy and excessive storage space in some watersheds. Researchers with Utah State University’s Watershed Sciences Department and the Center for Watershed Sciences at UC Davis recently tested the potential for removing dams from inter-tied water systems. We evaluated tradeoffs between fish habitat gains and water supply and hydropower losses from dam removal in California’s Central Valley. Using an economic-engineering water management optimization model known as CALVIN, we also assessed dam removal with the historical hydrology and with a warmer and drier hydrology expected with climate change. 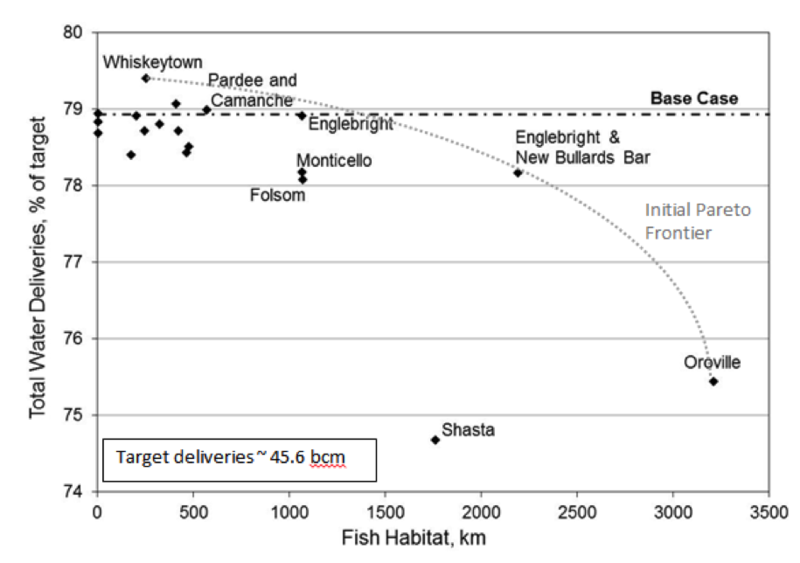 The study indicated that demolishing some dams, such as Whiskeytown, Pine Flat, Pardee, Camanche and Englebright, would likely improve habitat for migratory fish and warrant additional study. Removing some dams, however, relies on keeping and maintaining other dams. The research indicates that Shasta and Oroville dams are foundational to maintaining California’s water supply. The study also shed light on the changing benefit of dams through time. California will face increased water scarcity with the anticipated warmer and drier climate. Streamflows will be immediately delivered to urban and agricultural users, likely leaving several large reservoirs empty for much of the year – as we saw during the extremely dry months this past summer through winter. All this suggests that the economics of removing dams may be increasingly feasible in the future. Sarah Null is an assistant professor of watershed sciences at Utah State University and an alum of the Center for Watershed Sciences at UC Davis. 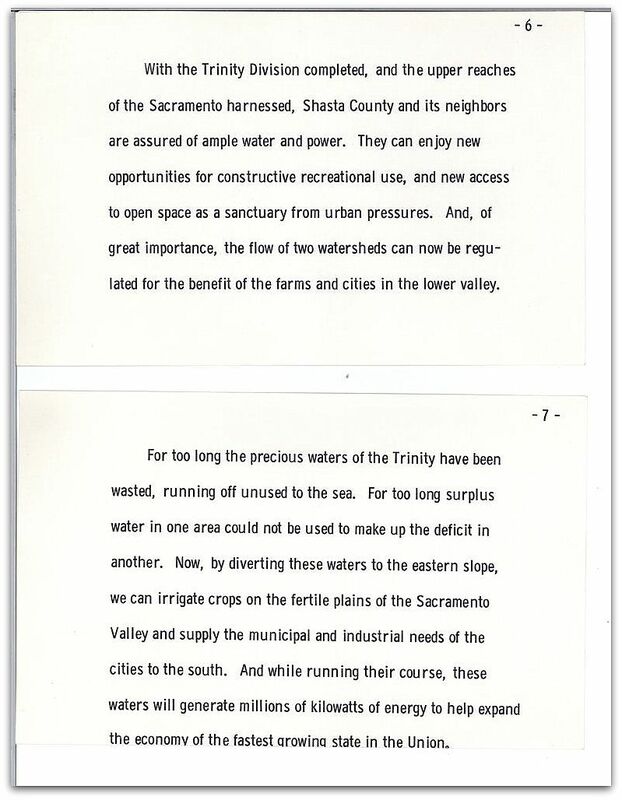 Excerpt of President Kennedy’s remarks at the Sept. 28, 1963 dedication of the Whiskeytown Dam and Reservoir. This entry was posted in Uncategorized and tagged dam removal, dams, Sarah Null. Bookmark the permalink. Another option would be to acknowledge that California, its population and agriculture are incompatible at their current levels, given a fixed water supply. Agriculture has expanded far beyond any reasonable bounds and has been growing in spite of inadequate water supplies. California has continued to allow and encourage additional populations to move here thereby exacerbating the problem to a level not seen before even though actual conditions are less severe than what California has encountered previously. The excessive removal of water from the water cycle by transpiration to the atmosphere where it becomes unavailable for groundwater recharge or replenishment to riparian zones negatively impacts our environment. This is especially a problem where deserts are being utilized for permanent plantings. Why should so many Californians accept having a reduced quality of life simply to embellish some of the world’s wealthiest property owners? A physical limit has been reached and management is almost inconsequential at this point unless both population and agriculture are reigned in. Sarah Null underestimates the value of dams and reservoirs for flood control, a primary reason many of them, including Pine Flat Dam, were built. Claiming in her piece, “California will face increased water scarcity with the anticipated warmer and drier climate,” is at odds with every climate scientist that suggest future climate change will likely introduce more need to artificially store rainfall when it occurs. Warmer, wetter storms will actually increase wet runoff, making projects like Pine Flat and others even more valuable for capturing water supplies and diverting them to groundwater storage in the future. I agree with Tim (and ignore Mike, as usual, for his single minded pursuit of ag interests) and I’m glad to see this very clear discussion of the tradeoffs. Where does O’Shaughnessy Dam rank in terms of dispensable? with real arguments and teling everything regarding that.